NICOLE RICHIE NEWS: Nicole Richie & friends to appear on Yo Gabba Gabba! Live! Nicole Richie & friends to appear on Yo Gabba Gabba! Live! Nicole Richie will be having some fun this weekend! As she along with Joel, Benji Madden and other celebs will all be appearing on stage for the Live performance of Yo Gabba Gabba! Live! in Los Angeles at the Nokia Theatre on Saturday 27th at 11am. Here is some info on the Yo Gabba Gabba! Live! 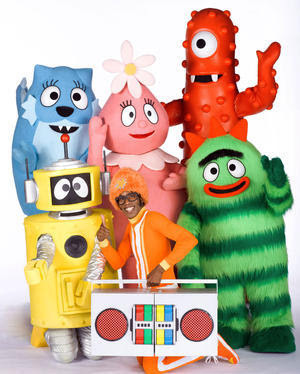 show ..
Yo Gabba Gabba! is a kids' TV show, but you don't have to be a punky parent to know that the lessons taught by vivacious host DJ Lance Rock and his giant puppet creature pals Foofah, Brobee, Toodee, Muno and Plex via song and kitschy imagery are exactly what toddlers and preschoolers need to hear, delivered so vibrantly that they actually want to. "Don't Bite Your Friends," veggies should join the "Party in My Tummy," and some times we all just gotta "Get the Sillies Out." All true, even for grown-ups, right? Like the popular Nickelodeon program, Yo Gabba Gabba! Live! : There's a Party In My City! -- performed in front of an eye-popping, light-bouncing Jumbotron -- appeals to both parents and kids alike, thanks to its diverse musicality. This sounds hilarious and fun!